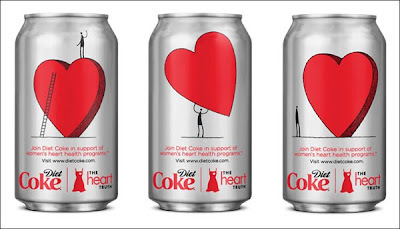 Larry Husten from Cardiobrief asks why is there a red dress on diet Coke cans? The Neuromarketing blog covers the fact that men's brains seem to be wired differently than women's when it comes to fMRI driven body image studies. Scott Stinson from the National Post opines about stupid studies that state the obvious. Weight loss plateaus be damned! Can a camera replace your food diary? Badvertising: KD Smart thinks you're KD Stupid! How many minutes a day should you exercise? Why is the Running Room promoting chocolate milk? Rapid weight loss is the best way to keep it off? Look at me, look at me, look at me!